Last week, in the midst of the sweltering summer sun, I started looking ahead to my fall race schedule. 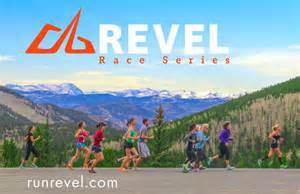 I’m back this week to “revel” about another very cool race series: The REVEL Race Series. NOTE: I’ve been a REVEL Race Series ambassador since 2014 and have had an absolute blast. The first thing you should know about these races is they are downhill and FAST. I mean really fast. Damn fast. If you’re gunning for a PR or Boston qualifier (all courses are USATF certified), look no further. Personally, 3 of my fastest 4 half marathons (and my personal PR) have come whilst pounding REVEL pavement. It’s actually kind of a shame you’re going so fast, because REVEL features some very scenic courses. Big Cottonwood is downright beautiful. I saw a moose while running it in 2014. Seriously, a moose. I don’t know if it was cheering me on or not (in my mind it was). REVEL also has a challenge medal. Run 3 of the 4 REVEL races in a calendar year (either half or full marathon) and you get the “Triple Reveler” medal to add to your collection. Another new feature they’ve added is an optional online coaches training program, specifically designed for preparing for a downhill race. As for registration, the prices are reasonable with NO STUPID PROCESSING FEES (woo hoo). Plus, you can get $5 off any race with a Facebook discount (worth it). On top of that, if you sign up for a team, you can get an extra $5 off. And I’d be happy to have you on my team. Just sign up for team “Tripping The Kenyans” at registration for any race and you get to keep an extra Lincoln in your pocket to do with as you please. I ran Mt. Charleston earlier this year (my 3rd fastest half marathon ever) and it was a great time. Come September I’ll be running Big Cottonwood for the third time (my fastest half marathon ever) and heading down Canyon City in November. It’d be cool to see you there too. REVEL in a great race series… and Run on! Posted on August 1, 2016, in General and tagged REVEL, Revel Big Cottonwood, Revel Canyon City, REVEL Mt. Charleston, Revel Rockies. Bookmark the permalink. 2 Comments. Canyon City is on my 2017 schedule (why yes, Scott, I HAVE planned that far ahead), and I’m looking forward to it. November is always tough for me to schedule because a lot of my favorites fall (no pun intended) during that month. Big Sur Half, RnR Las Vegas . . . but I have already penciled in Revel for all the reasons you mentioned in your post. On another note . . . Suicide Squad. Joker better not disappoint me. Hey Chris… very cool that your running Canyon City (you’ll dig it). And I’ve got high hopes for Suicide Squad (word I’ve heard is that it’s real good). As for Leto playing the Joker, that’s an almost impossibly tall order to fill. I’m not looking for him to channel Heath Ledger (or Mark Hamill), but give us an interesting new take on the Crown Prince of Crime.